We’d all like to see into the future, right? Twenty five years ago, standing outside a telephone booth in the rain waiting for someone to finish a call, wouldn’t it have been comforting to know that not too much later we’d all be walking around with mobile phones in our pockets? Not only that, we’d also have access to every single piece of information in the world in that little phone. Mind blowing! Well, those who want to know what golf might be like in the future may have the luxury of seeing it in action now… if they can get themselves to a soon-to-be- opened facility in Hong Kong, set to open before the end of 2015. The Hong Kong Golf and Tennis Academy, designed by Nicklaus Design and built by Southwest Greens Construction, will boast a state-of-the art three story driving range and six hole course, including magnificent water features and a short game area all aimed at opening the wonderful game of golf up to the young and keen adult beginners. The facility is located in the Sai Kung area which is known for its stunning natural countryside and in addition to its unique golf facilities it will also have overnight accommodation, dining, a fitness centre and other leisure pursuits. But the game changer at the Hong Kong Golf and Tennis Academy is that it will be built entirely with market-leading synthetic turf systems thus ensuring stunning playing conditions 24/7, 12 months of the year. 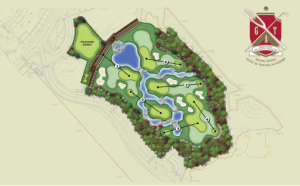 “We have a complete product range of synthetic turf systems covering every conceivable area on a golf course, whether it be fairways, rough, tees, bunker areas, cart paths, lake bank stabilization and, of course, the core product being our golf green surfaces,” explained Kevin Holinaty, president of Southwest Greens Construction. Golf has not been as quick to embrace the synthetic surface as some other sports, and much of that was down to the quality of the product at the time, coupled with the natural conservative nature of golfers, but Holinaty is seeing the rate of progress increasing, particularly over the last five years. “In the early days the quality products were just not there, and golfers are so much more demanding about the surface on which they play than sportsmen and women in other sports. “But we have evolved and developed products which perform exceptionally well. Coupled with that we have worked hard to educate the market, demonstrating what is possible,” explained Holinaty. The Southwest Greens’ alliance with Nicklaus Design brings together two of the premier players in the golf development arena, delivering the vision of the developer – New World Development – whose goal was to produce the ideal the finest training facilities, in one of the most iconic venues in the world. “With the variety of synthetic turf surfaces from Southwest Greens, the Nicklaus Academy will be able to simulate the finest conditions possible – without the potential of damaging the environment with fertilizers and pesticides,” said Ted Simons, chief operating officer for Nicklaus Academies, who will be operating their Academy Program at the facility. Southwest Greens International has worked with Nicklaus Design for several years in a marketing alliance for the Southwest Greens residential product channel, but the Hong Kong project is the first whereby Nicklaus Design is providing the design, with Southwest Greens Construction building the facility. Founded in 1996 in the USA, Southwest Greens International is considered to be the global leader in designing and installing synthetic turf for both residential and commercial use, and it now boasts over 75 franchisees in more than 20 countries. Over 35 top PGA golfers, including Justin Rose, Adam Scott, Sergio Garcia, and Annika Sorenstam have improved their short games thanks to a Southwest Green putting surface in their gardens, while there are many, as yet unknown, would-be golfing superstars practicing hard on home-based greens, trying to reach the same heights. Southwest Greens Construction is the global construction arm for Southwest Greens International, responsible for executing all major commercial projects for the Southwest Greens brand. “We see it as a very exciting time for both of our companies, and another example of how perceptions are changing to the extent that clients are willing to look at synthetic solutions as real and truly viable options,” said Holinaty. The beauty of the new facility will be its ability to change from driving range to six hole pitch and putt course depending on the need at the time, and it ensures that the needs of the Hong Kong golfers to hone their driving skills at key times in the day can be combined with the new breed of young golfer learning the intricacies of the game under the tutelage of high quality Nicklaus Academy coaches on perfect surfaces. Designed by golf course architect Jim Wagner of Nicklaus Design, the development ensures that the very most is made out of the space available, while at the same time ensuring that new golfers as well as those more experienced are fulfilled by their experience. “Our client has provided us with an extraordinary opportunity to showcase the relationships that Mr Nicklaus has forged over the years between Nicklaus Design, Nicklaus Academies and Southwest Greens,” said Wagner. “From early on in the project we had a vision to create a product that was not only unique, but pioneering in the development of golf. 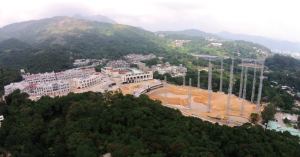 In addition to its unique golf facilities, the Hong Kong Golf andTennis Academy, which is due to open before the end of the year, will also have overnight accommodation, dining, a fitness centre and other leisure pursuits. “It is going to be a truly great place for sports lovers to gather, be trained and excel,” said Jay Liu, Kai Wai, of Hong Kong Golf and Tennis Academy. So the future of golf… stunning facilities in pristine condition, and not a mower in sight. Mind blowing! MacCallum, Scott. “GMé | Issuu 100.” Issuu. 1 Feb. 2015. Web. 13 Feb. 2015. <http://issuu.com/portman/docs/gme_february_2015>. ← Southwest Greens of the Valley…now offering a 5mm cushion for your custom putting greens!